So I was supposed to have read and finished The Mountain of Adventure for the blog this week. Unfortunately time got away from me and I only managed to read half, so I thought I would give you half a review which would give me a chance to look at it more in depth. I do like the beginning of this book, the scene of pulling up to the mountain farm in the car. Bill has joined Allie and the children on their holiday. This seems to be the first proper time when you feel something between Bill and Allie, before the nice surprise in the next book. The Mountain of Adventure does remind me of Five Get Into a Fix, with the Welsh setting and the rumbling mountain. However the reasons behind these two adventures are very different. Of course the children are very excited to be on the farm and able to explore. They explore the farm after the highest of high teas by Mrs Evans and her husband Effans. Call me strange but don’t understand why Blyton changes the “V’s” to “F’s” for the Welsh accent. She doesn’t seem to do it for the Famous Five or any other novels. It can be quite off putting for me. I don’t know if anyone else feels the same. Philip is on form in Mountain, in the first five chapters he adopts two new pets for the adventure, a slow worm called Sally Slither and a goat kid called Snowy. Snowy becomes a firm favourite with all the children, even Dinah who refuses to be anywhere near Philip when Sally Slither is on the move. The kid is a sweet little nuisance, and head butts Philip and the others when he doesn’t feel like he’s getting enough attention. He is an endearing little soul, and it makes me think about how nice it would be to have a little kid goat about but then I’m reminded through Blyton’s own words that goats do like to eat everything and would not necessarily be a good pet to have a home. However, do feel that through the book, you can almost have Snowy as a pet along with Philip and the children. Apart from having a holiday to be excited about the children are also excited about having a donkey each to ride up and down the mountains. Lucky them, is what I say, except I can’t ride a donkey or a horse as well as they can. Anyway, they hire some donkeys from the shepherd’s brother David, enough for Bill and Allie to come as well, and ask for permission to camp for a few days and try and find the ‘Vale of Butterflies’ in the mountains. Before they can set off however, after a few days getting used to riding the donkeys, Mrs Mannering gets her wrist trapped in a barn door. Bill takes her to the doctor to get an x-ray in case there was a broken bone. After they get back, it is confirmed that Mrs Mannering had a small fracture in her wrist, and that she can’t go on the donkey ride. Bill, who is described as being very fond of Aunt Allie, says he will stay with her and take her back to the doctor in a few days. They agree that the children can go on the donkey ride if David can take them . David is a weedy fellow who agrees to take the children, though reluctantly. He starts leading them through the mountains, and the children are happy to follow them for a while. Unfortunately, David does not speak much English so that hampers the children’s communication with him, and when they try to find out if they’re going the right way for the butterfly valley, he can’t explain that he doesn’t know where he’s going and soon takes them away from the track. The children trust his judgement, but think he’s a bit of a fool when he starts getting scared, and eventually runs away from them with the donkeys leaving them stranded on the side of a big mountain. The children get geared up and set their camp in a cave, to spend the night. 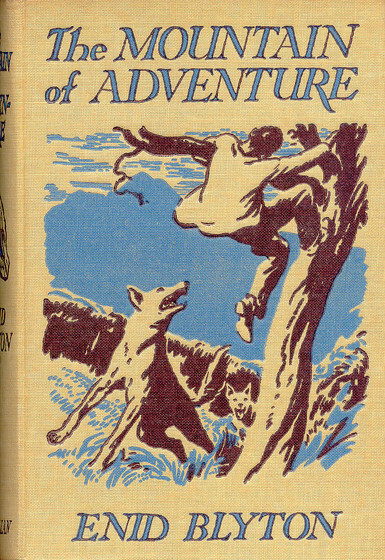 When they wake up in the morning, after a disturbed night, because of Welsh ‘wolves’, who make friends with Philip, Lucy-Ann is sent down to the stream to wash their things and finds a person in one of the trees, warning her of the mountain, which quakes and rumbles. Lucy-Ann flees back to the others to tell them of the man, but when she returns he’s gone. This is as far as I got with the reading this week, and I think it’s a good place to end on as it leaves us gagging for more of the adventure to come. One thing I would like to say about the Adventure stories, that I have never really noticed before is the girls often end up doing the housework, and the boys encourage it. I know that people often criticize the Famous Five, and Julian in particular, for enforcing gender stereotypes, but there is a lot of reinforcement in the Adventure series as well. Philip and Jack do tend to expect Lucy-Ann and Dinah to sort the food and washing up out. It just isn’t as obvious as the stereotyping in the famous five. I still very much enjoy this adventure and can’t wait to finish it. What are your thoughts about Mountain of Adventure? This entry was posted in Book reviews and tagged Aunt Allie, Bill Cunningham, Bill Smugs, Dinah Mannering, Jack Trent, Lucy-Ann Trent, Philip Mannering, The Mountain of Adventure. Bookmark the permalink. I like ‘Mountain’ very much – probably second only to ‘Valley’ in the Adventure series. I agree that ‘Effans’ for Evans is a bit off putting and it does come across as a bit patronizing, and for that matter the treatment of poor old David is a bit disdainful. Still, those early chapters set up the adventure very nicely and Mrs Evans certainly does provide some superb food: a big tongue garnished with parsley, an enormous salad with hardboiled eggs, two cold roast chickens with curly bacon, scones, cakes, jams, honey, raspberries and creamy milk – and that’s just one meal! Blyton’s adults do seem to have bad luck at holiday time but they are made of stern stuff. After Mrs Mannering traps her hand in the barn door she gave just one scream and then “made not a sound”. Thank you for the review, Stef, ‘Mountain’ is my all time favourite (for sentimental reasons). I remember first reading this book and falling heavily in love with Enid – something that has lasted to this day. As an adult I wonder about Allie’s ‘accident’ – a few days away from the children together. No wonder they were soon a married couple. As for the sexism – neither my sister or myself noticed it at the time and my sister certainly didn’t start doing the housework! Even back in the sixties when I read Mountain for the first time, I thought it risky of Bill & Allie to allow the kids to just go off with some unknown bod on donkeys into equally unknown mountains. Even more so today do we feel alarm at such a proposal. Anyway, we wouldn’t have a story if they hadn’t made the journey!